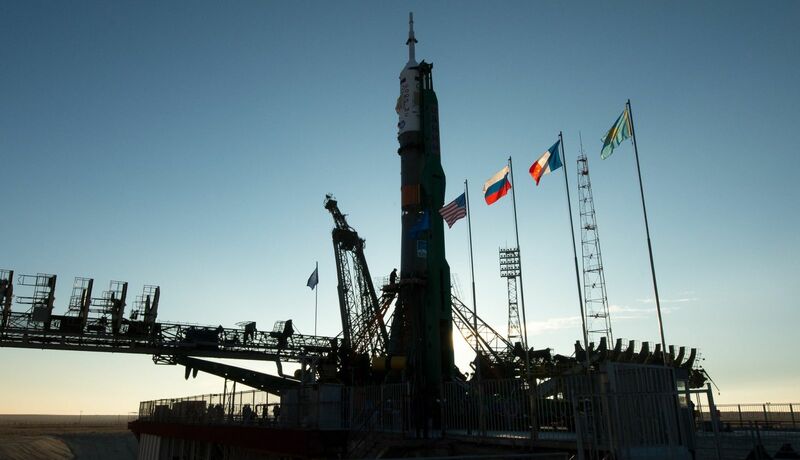 A new trio of space flyers is gearing up to launch toward the International Space Station (ISS). Launching atop a Soyuz rocket, the crew in their Soyuz MS-03 spacecraft is slated to leave terra firma at 2:20 a.m. local Kazakh time Nov. 18 (3:20 p.m. EST / 20:20 GMT Nov. 17) from Baikonur Cosmodrome in Kazakhstan. The trio – Russian cosmonaut Oleg Novitskiy, European Space Agency astronaut Thomas Pesquet, and NASA astronaut Peggy Whitson – will take the standard 34-orbit rendezvous path to the ISS rather than the quicker 4-orbit route. As such, the three will spend nearly two days inside the cramped capsule before arriving at the outpost on Nov. 19. Once aboard, they will reside there for some five months as part of Expeditions 50 and 51. 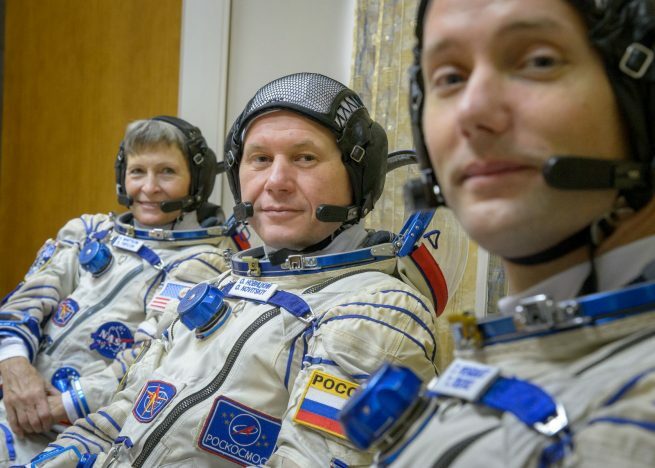 The trio will join Roscosmos cosmonauts Andrei Borisenko and Sergey Ryzhikov as well as NASA astronaut Shane Kimbrough to bring the ISS crew complement back up to six to round out the year. After the crew settles in, in December, the outpost will be gearing up for a busy period of visiting vehicle arrivals. Additionally, in January, a number at least two spacewalks will be performed to upgrade the space station’s batteries. Noteworthy, this will be the final time for at least a year that a six-person crew will form an expedition. Starting with MS-04, Russia will be reducing its station crew size from three to two, bringing the maximum to five. This reduction will continue until Russia launches its long-delayed science module, called Nauka, which is currently planned for late 2017 or early 2018. 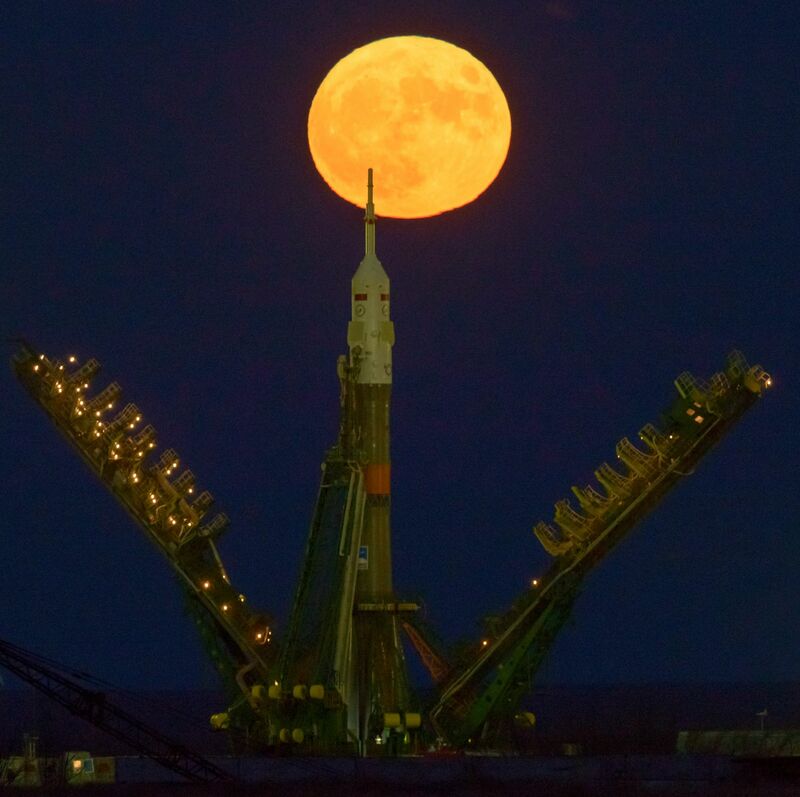 The crew arrived in Baikonur on Nov. 1. Once there, they spent the next two weeks going through typical pre-launch campaign activities. This included visiting the spacecraft, putting on their Sokol launch and entry suits for fit checks, and an ingress exercise. Additionally, many pre-flight ceremonies were performed, such as flag raising, tree planting, and visiting the Cosmodrome museum. Later, the crew watched the final configuration of their rocket and spacecraft and also viewed the Progress MS-04 cargo ship, which is set to launch on Dec. 1. The Progress is currently on a test stand awaiting final inspections prior to itself being loaded onto a Soyuz rocket for liftoff. The rocket is 162 feet (49.5 meters) tall and comprises two stages. The first stage is 69 feet (21.1 meters) long and 9.6 feet (2.95 meters) at its widest. It is powered by a single RD-108A engine, which burns for about 280 seconds. Strapped to the side of the first stage are four liquid-fueled boosters. Each is 64.3 feet (19.6 meters) long and 8.8 feet (2.68 meters) wide bringing the total width of the base of the rocket to about 27.3 feet (8.31 meters). About 118 seconds into the flight, they are spent and jettisoned. The second stage is 21.9 feet (6.7 meters) long and 8.7 feet (2.66 meters) wide. It is powered by a single RD-0110 engine. It has a total available burn time of about 230 seconds. Finally, sitting on top of the second stage is the spacecraft itself. On Monday, Nov. 14, the Soyuz-FG launcher that will send the spacecraft spaceward was rolled to Site 1/5, the same launch pad that supported the liftoff of both Sputnik and Yuri Gagarin in 1957 and 1961, respectively. Once the whole stack was rolled to the launch pad, the Soyuz service structure was raised and engineers began connecting the rocket to ground power umbilicals as well as fueling lines. After a series of checkouts, countdown operations will begin Thursday afternoon. This will include loading 274 metric tons of propellants inside the vehicle’s tanks at around five hours prior to launch. Finally, the crew will board the spacecraft some 2 hours, 30 minutes prior to launch. Soyuz MS-03 is the third of the MS variant of the storied Russian Soyuz capsule. When it launches, it will be the 132nd flight of any Soyuz since 1967. Furthermore, this will be the 86th crewed launch to the outpost and 181st overall since the Zarya module launched in 1998. 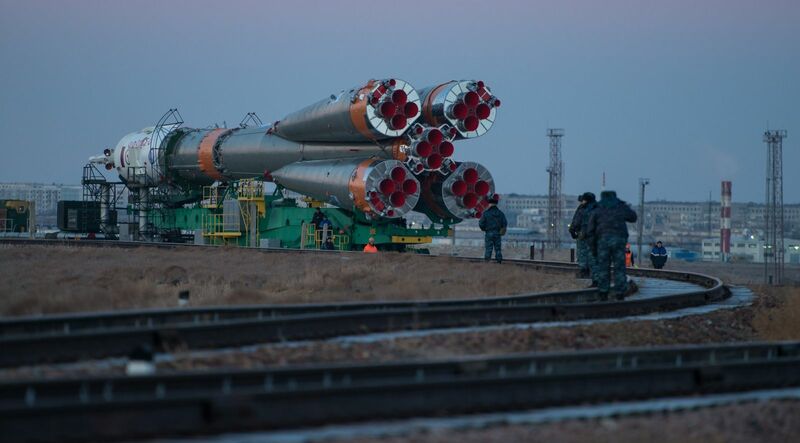 The next launches to the ISS will be the Dec. 1 launch of MS-04 as well as the Dec. 9 launch of the Japanese Kounotori 6 cargo ship.